Lydia Koltai is an herbalist, permaculture practitioner, community activist and homeschooling mother of four amazing children. She began her herbal studies in 2003, after learning about indigenous cultures and their medicinal plant practices in an Ethnoecology class in college. In 2007, while pregnant with her first child, Lydia completed a 13-week shamanic apprenticeship with Susan Weed. Since that time, she has continued to practice and study, providing herbal remedies and advice to her family and community and attending herbal classes to continue her own learning. Currently, she is enrolled as a student in the Chestnut School for Herbal Medicine. 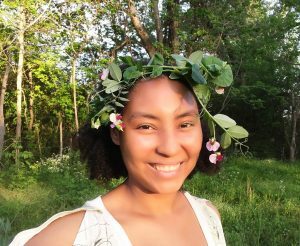 For the past two years, Lydia has been leading herbal education workshops in her community and is passionate about sharing the wisdom of the plants with anyone who shares a love for the green world. Workshop Title: Wild Medicine – A Walk In The Woods With Plants That Heal. This workshop will consist of a 1.5-2-hour plant walk and a plant spirit meditation exercise. I will lead participants on a walk around the grounds and forest, identifying medicinal plants that grow on the land, discussing their uses, and sharing samples of medicine I have made with those plants. We will discuss various ways to connect with and learn from plants as well as how to identify plants safely. We will conclude the class with a plant spirit meditation designed to help participants connect more deeply with a plant and begin to build their own relationships with healing plants.